← From Dodo Towers to ‘Beckingham’ Palace! Hallooo dear Dodopadlers, Miss Peabody here! Have I got news for you! As you well know, Lord Dodo is deftly adept at merging the use of technology (whether Tweeting with you or sharing on Facebook) with the glories of paper (including his marvelous Dodo Pad diaries, organisers and sundry produce). However you may not know that Lord Dodo also enjoys the convenience of his new iPhone – but he very quickly realized it needed a companion to receive notes and jottings whilst using the phone (or even a place to doodle during long conversations!). Thus, the Dodo eyePad was born! Exactly the same dimensions as the iPhone, the Dodo eyePad is the perfect paper companion to your smartphone. Just pop it in your pocket along with your phone for notes on the go. Click here for more information on the Dodo eyePad and find out how to get your hands on your very own! Recently on Facebook Lord Dodo posed the question to those of you who use a smartphone, if you also use paper along with your technological device and the response was overwhelmingly positive! 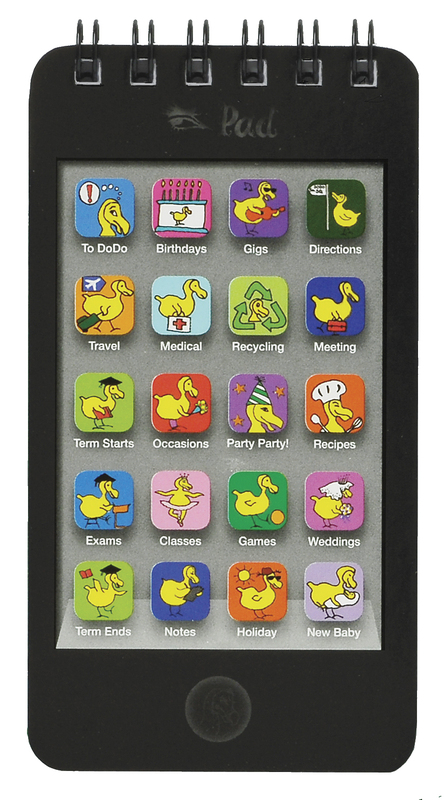 We here at Dodo Towers were dodelighted to read the replies from Dodopadlers who enjoy using their Dodo Pad diaries, along with their smartphone, to stay organised. And…I have heard well-founded rumours of more technological dodelights on the way, so stay tuned! To be among the first to find out about new products and offers, be sure to follow Lord Dodo on Twitter (http://twitter.com/lord_dodo) and Facebook (http://www.facebook.com/lord.dodo). And for timely tips and organisational ideas, follow me on my very own Twitter account: http://twitter.com/DodoPadBlog!